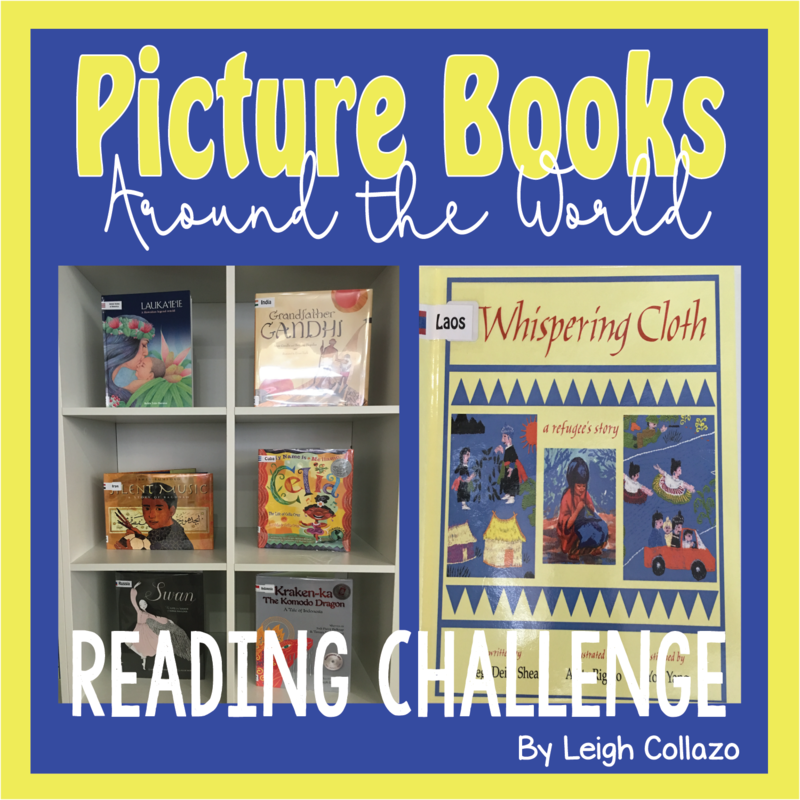 Next month, I will challenge my middle school students to read picture books about countries around the world. I have been planning this project for months, but it's been kicking around in the back of my mind for years. Back in April, I purchased around 100 multicultural picture books for older students. Back then, I didn't really know exactly how I wanted to do this; I just knew it felt necessary for my students. Be an Armchair Traveler! We have 67 countries represented through our picture books. Can you read them all? 1. Increase the "cool factor" of our fabulous picture book collection. Picture books are not just for preschoolers! This is a misconception I fight constantly. I encounter picture book resistance from students, from parents, and even from some teachers and school administrators. Most of these objections come from people who haven't read a picture in a long time. I will agree that many picture books are targeted at a very young audience, but there are many, many picture books in recent years that are targeting older audiences, even adults. I am convinced if my picture book nay-sayers took a few minutes to read Patricia Polacco's tear-jerker Pink and Say or Elvgren's resistance story The Whispering Town, they would change their minds about picture books pretty quickly. 2. Increase general reading among my huge ELL population. I am in an international school where less than half of my students are native English speakers. The majority of our student body are students whose English language skills vary widely. We have some students who speak little English and must focus hard just to understand simple instructions from their teachers. Other students are learning English as their third or even fourth language. Some of our students have grown up around so many languages that they do not have one dominate first language. Like graphic novels (also fabulous with ELLs! ), picture books have lots of pictures to accompany the text, making them more accessible to ELLs. 3. Increase general knowledge of the big, wide world. My school has students and teachers from over 50 countries around the world. Many of my students have parents who originate from two different countries. And most of our students hail from families that travel internationally during holidays. Yet while all these things are true for my students, I doubt many of them really understand the culture and history of most of the countries they visit. They visit these places because of their touristy beaches or their incredible skiing or outdoor sports environments. But do they leave the pristine beaches and posh hotel rooms and travel into the heart of the country? Do they know how the average citizen there lives? What do local children eat for breakfast? What keeps local families busy during the day? What do their homes look like? Do they have glass in the windows? Do they have electricity? Do they have a dirt floor? Do children go to school, and if so, what are the conditions like? What is the political climate? Is there freedom? Chances are very good that my students, even if they have visited these countries, could not really answer these questions. Picture books about life in other countries help our students see how people really live there, which is often very different from what tourists see. Books like Nasreen's Secret School (Winters) or Dreamers (Morales) help students better-understand current events, politics, and resistance. Elvgren's The Whispering Town and Deedy's The Yellow Star give readers a window into the past and allows them to draw connections to today's news. and back are printed, there is room to record 25 titles. 4. Give context to current events. This past summer, a military coup briefly overtook the government of Turkey. The United Kingdom voted to break away from the EU. Venezuelans encountered widespread food shortages and violence in public schools. Bombs went off in Afghanistan, Pakistan, Syria, Egypt, and many other Middle Eastern countries. There is an ongoing famine in northern Nigeria killing thousands of refugee babies and children. Our students might hear about these things in the news. They may see images on TV. But what is really happening there? Why is it important? How does it affect the people who live in these countries? Picture books featuring a story about a child or teen in another place can help put a face on the daily headlines. Obviously, we can't send our students into dangerous situations to see these problems for themselves. But we can find picture books about war-torn regions to help them understand that the faces and places they see on the news are real. I don't want to scare my children, but I don't want to raise kids whose heads are perpetually stuck in the sand. Giving the news a human face helps develop empathy in children. We will never see any change in the world if our kids only know what's happening on their block and in their school and on YouTube videos of people playing online games. Even the TV news only hits the sensational highlights of what's happening beyond our own backyards. Most people in the world do not live like our students do. They may have a different religion or no religion. They wear different clothes. Their climate might be hotter or colder or wetter or drier. They may ski to school, or ride on a boat, or walk 10 miles through thick brush. Or they may not go to school at all. Maybe they eat foods our students would never consider, or maybe their beliefs mark the foods our kids love as 100% off-limits. Maybe they don't have the freedom to speak out against injustice. Maybe they've never heard of the internet or TV or the Kardashians. When I read the Comments sections of international news stories, I see the need for people to connect with the human experience beyond their own backyard. While our students may not ever visit another country, it's still good for them to experience diverse places and people and ideologies, if only through a book. For many students, that picture book about poverty in Uganda may represent their entire knowledge of life of regular people in Uganda. Step-by-step, here's what you need to do to help your students take their first step into another country. Order lots of picture books! Unless you already have lots of multicultural picture books representing lots of different countries, you will probably need to order some or many new ones. I am constantly on the lookout for new countries to add to my picture book collection, and to be honest, I've had a great time researching them! My advice for ordering books is to be deliberate if there are certain countries you are looking to add. Where are your students from? Do you have lots of students from Central American countries? Does your school service any immigrant communities? Do you have any refugees? What countries have been in the news lately? What historical periods are studied at your school, and how can your picture books help enhance these periods? What countries are affected? What human-rights issues are important to your students? What is the status of these issues in other countries? What traditional stories do your students know? Is there a version from another culture? Though there are tons of Cinderella stories from other countries. I also looked for lesser-known stories like Raama iyo Boqorkii Cirfiidka = Rama and the Demon King (India) and Kraken-ka the Komodo Dragon : A tale of Indonesia. Make the books easy for students to browse and discover. Once you have received your beautiful new books, you need to make it easy for students to find them. 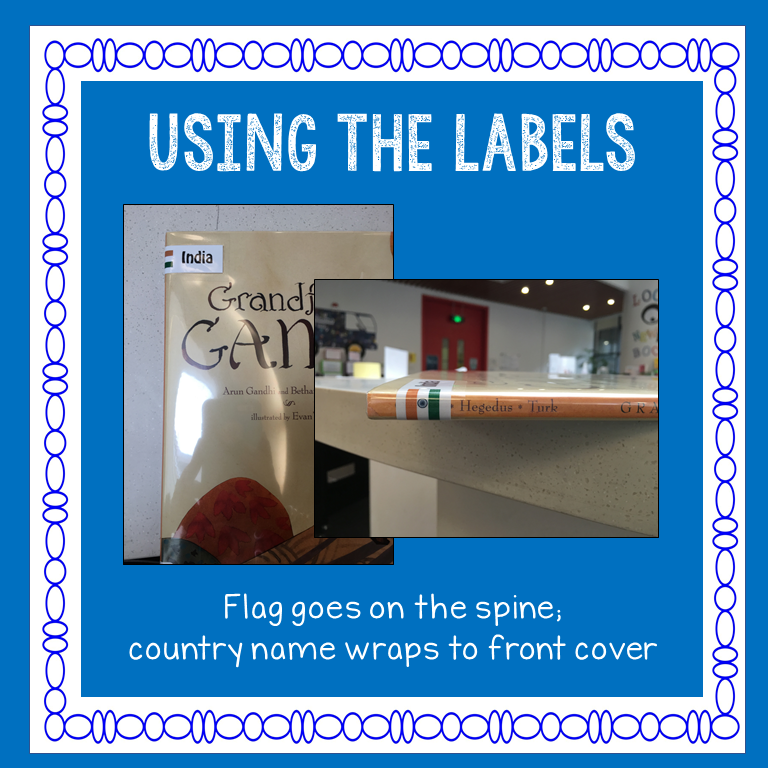 I've spent the past two weeks labeling each of my multicultural picture books with a country flag (top of the book spine) and the name of the country (on the front cover, near the flag). This step is important because many picture books will not have the country's name in the title or the description. Even a catalog search for the country does not always bring up the picture book(s) I bought to represent that country. Decide how you will promote the challenge. All summer, I debated on having a prize incentive for this project. I thought about offering a prize drawing for reading a continent or for reading a certain number of countries. 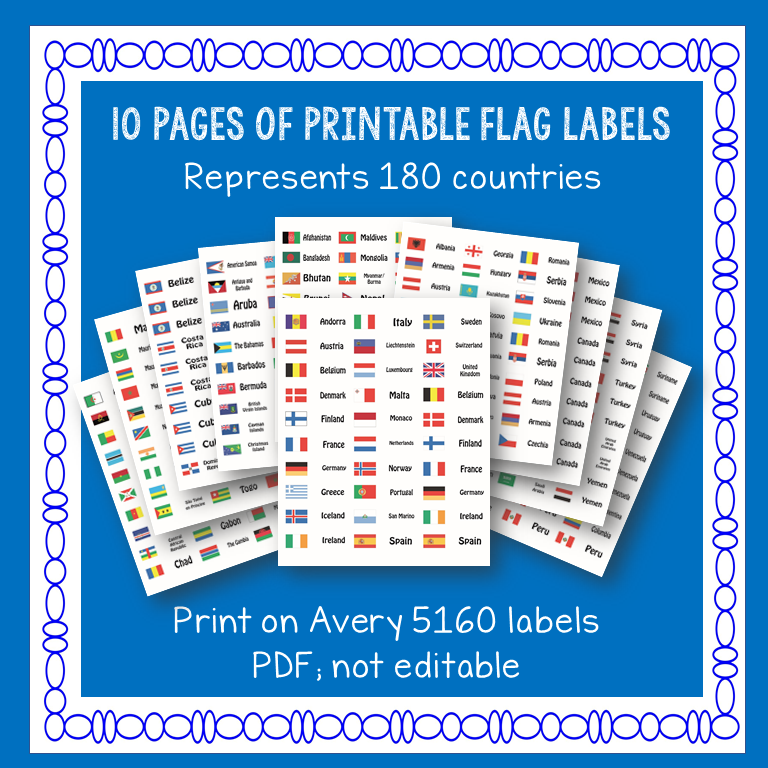 I thought about creating small stickers to represent each country, then students could get a "passport stamp" for each country they read. Ultimately, I have decided to scrap the prize incentives altogether, at least for now. No, some students will not participate. Some will read a few picture books and give up on the challenge. But I really do think many of my students will get into the challenge. Picture books are short and visually interesting. Most can be read silently in under 10 minutes. I will read some of the books when classes come to the library for their bi-weekly library lessons. In short, I think I will have lots of student interest without offering any prizes or gimmicky incentive at all. I think many students will do this challenge just because it's FUN and not terribly difficult. Up next: Promotion and kick-off! So what am I doing to promote the Challenge? Well, to be frank, I'm not entirely sure at this point. I know I will kick-off the Challenge during our library lessons after our Fall Break. I plan to put together a presentation about my inspiration for the Challenge (a British journalist who did a similar Read Around the World project) and telling students about some of the books. I'll probably also do some sort of "Did you know...?" trivia about country names and controversial divisions. Did you know, for example, that in 2015, the Czech Republic was renamed Czechia? Do you know why some countries say Myanmar and others say Burma? Did you know that China claims both Hong Kong and Taiwan as part of China? Do you know what modern-day countries made up Ancient Mesopotamia? I'll also be reading the books aloud to my students. I'm thinking I'll give them a choice of three countries to "visit" today, and I will read the book that represents the country they select. This will also likely involve some background information and photos of the three countries, so I'm sure my Humanities and World Geography teachers will really love me with this project! We are doing something similar in elementary - We've got a big world map up, and displays of books from each continent, I'm encouraging students to read around the world, snap a picture onto a padlet and put a sticker on the world map of where they've read a (picture) book from. I love the idea for this program. Were there any websites or lists you used when doing your book ordering? Thanks for the inspiration! Hi, Kerry, I used a LOT of resources for this project--Goodreads, Titlewave, Googling "picture books about ____ (insert country)," Pinterest (I have a Pinterest board full of multicultural booklists...https://www.pinterest.com/mrsreaderpants/picture-books-secondary/), students and teachers from my international school...The thing that I noticed most is that a lot of countries have picture books, but you can't always find them by the country name. And many, many of the multicultural picture books were written by Americans, Canadians, British, and Australians. Chinese and Indian writers are well-represented as well. 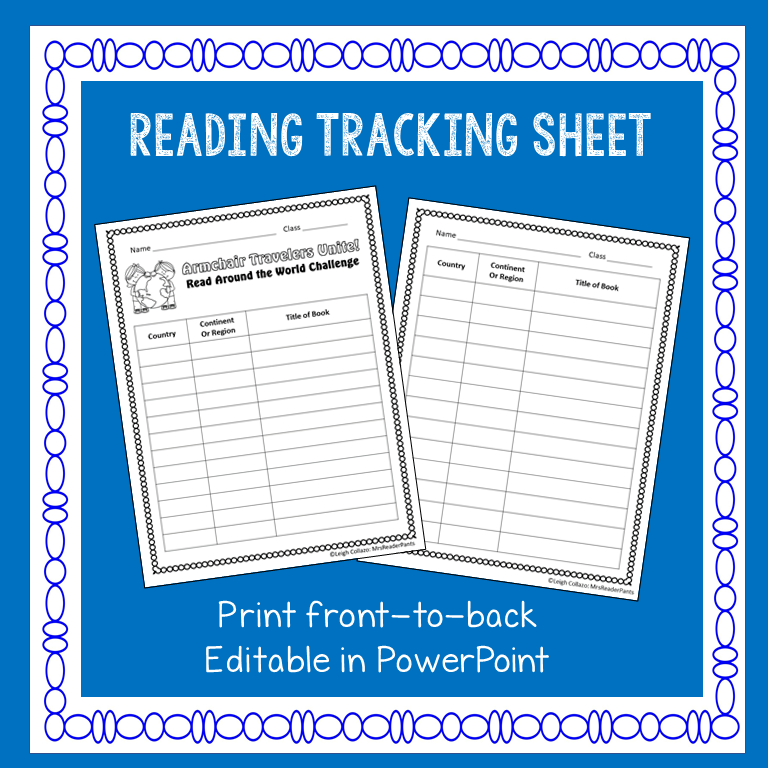 Does your TPT include the actual list of books in your collection? I am looking for something like that. Thank you!